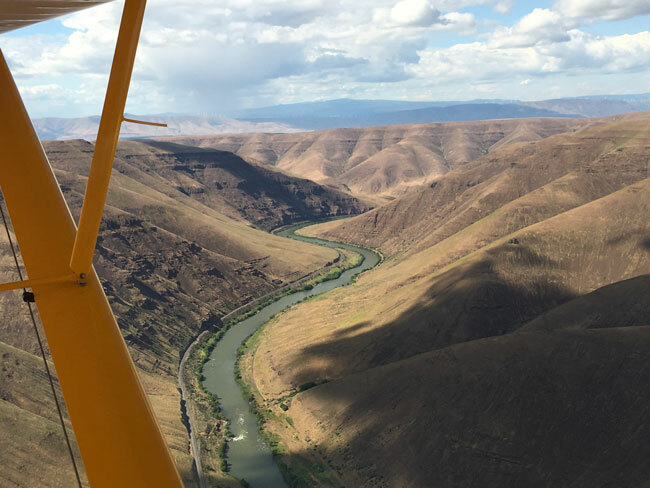 Running parallel to and between two sharp turns in the Deschutes River—deep in a narrow canyon—Bull Run is barely discernable as a landing strip. The tan summer grass blends into the reddish beige earth of the canyon. Peering through the open portal on the Carbon Cub I was flying, I realized that in this case, you really have to know what you’re looking for to find this spot, which is maybe how it should be. It also struck me in that moment that even for an old crop duster pilot like me, one who’s used to flying low but who has relatively little experience tooling around in the mountains, this kind of strip, short and nestled by high rock on all sides, gives serious pause. As it should. That’s why I was with veteran bush instructor Wes Valpey, who was showing me the ropes of backcountry flying, something I’d been wanting to do for ages and finally got the chance to, like a lot of our readers, I’m guessing. The good news is: It’s totally doable. There are several myths about backcountry flying that keep private and recreational pilots from experiencing the beauty, the grandeur, the recreation and the organic fun of flying the backcountry. Backcountry is an informal but widely used term that refers to land that is isolated, undeveloped, remote and difficult to access. It includes federally designated and administered wilderness areas where access is usually permitted only on foot or horseback—no wheeled vehicles allowed except (in many cases) airplanes. Just west of the Continental Divide at 8,000 feet two glacier melt waterfalls cascade 5,000+ feet heading for the Pacific. The word “extensive” isn’t big enough to cover how much land the nation’s backcountry encompasses. Much backcountry land is forested public wilderness and is administered by the U.S. Forest Service under the Department of Agriculture (i.e., Alaska wilderness areas and national forests). The Bureau of Land Management (BLM) of the Department of the Interior generally covers other public lands and manages access for open-range grazing, mineral and oil extraction, and a variety of other uses. Most wild areas that fall under the definition of backcountry are located on but not limited to public land. Large private tracts of land can be considered backcountry, many are available for recreational use, and some of them have airstrips. Bicycles, ATVs, wheelbarrows, roller skates, dirt bikes and other wheeled vehicles are excluded because they impact the ground for miles and miles on and off trails. They disturb game trails, crush plants and insects, and disturb wildlife habitat. Motorized wheeled vehicles make noise down in the habitat all the time they run. Light airplanes, on the other hand, fly thousands of feet above the surface, quietly glide in for landing on pre-ordained turf landing strips, and roll for a very short distance, once for landing and once for takeoff. The only significant noise occurs on takeoff and climbout and is limited to open space in a limited habitat. On top of that, it only lasts for 10 seconds or so. It is the lightest environmental touch possible short of parachuting in. The Forestry Service and BLM generally recognize this reality and allow the American flying public access to already-established strips. In fact, there’s a positive good with these wilderness flyers. Backcountry pilots augment government agencies’ effectiveness in managing the land by being de facto extra eyes and ears to monitor habitat health and report fires/disease before they grow into disasters, assisting in the stewardship of the land without additional cost to the taxpayer. 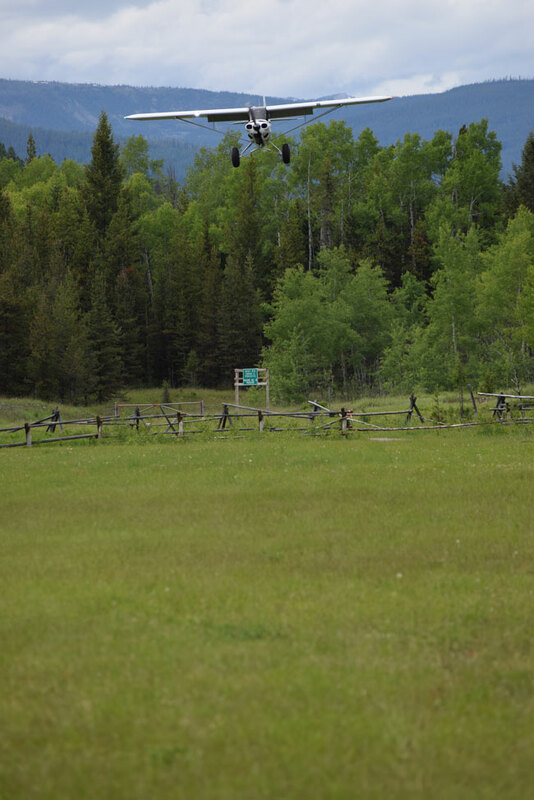 Scott Newpower in his V35 Bonanza on approach to Shafer Meadows Airstrip (8U2), Great Bear wilderness, Montana. Alternate entry, a 14-mile hike. For backcountry pilots, flying is also about access: access to remote and beautiful places; access to a unique freedom; access to more time, solitude, peace, quiet, splendorous vistas, pristine forests, rivers and lakes; access to unique and rare experiences; access to the center of here and now; access to a passionate, environmentally informed and vibrant community of dedicated and interesting like-minded folks, true stewards of the land. You might think that you’ll need a Super Cub on steroids to access all this wild goodness, but it’s not that hard. 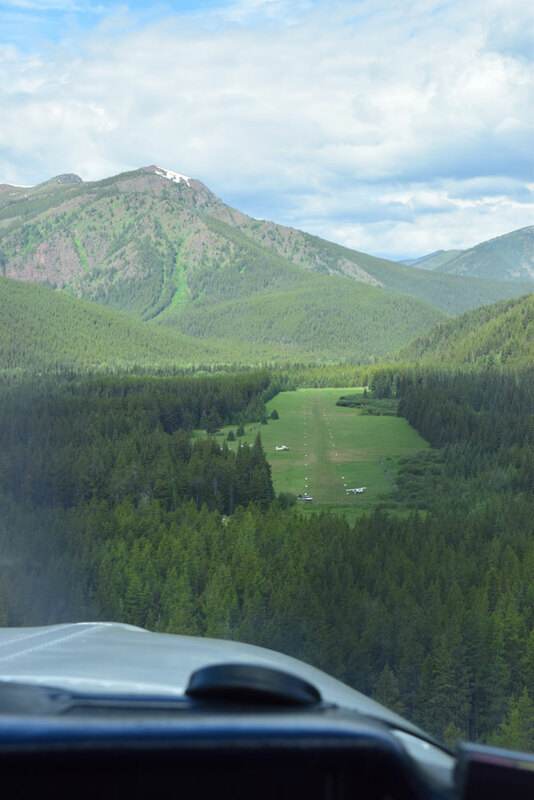 You don’t need a tailwheel or STOL airplane, a special rating or commercial-level flying skills to access and enjoy over 120 million acres of wilderness. While some strips are limited, based on their geography, to airplanes that can land on the roughest and shortest patches of land, many—if not most—backcountry runways are accessible by the run-of-the-mill piston single. And that gets you a lot—access to national park outdoor grandeur without the traffic, congestion and crowds. To get started, you might want to reach out to people in your community who can point you in the right direction. A good place to start might be Facebook, where there are a few popular and highly active backcountry flying groups. Another great avenue is the Recreational Aviation Foundation (RAF), an organization dedicated to improving access to the backcountry to aviators of all kinds. 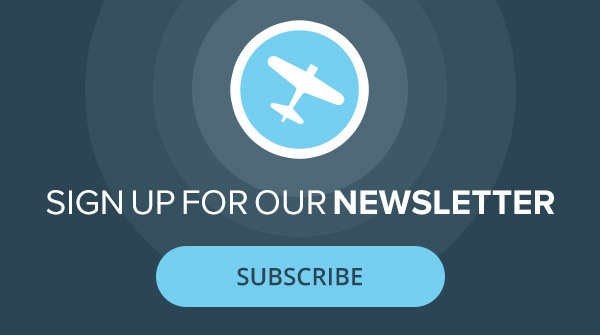 However you do it, find a mentor/instructor, take a few ride-along trips, practice and fine-tune your spot landing skills, make density altitude a primary weather consideration and learn the vital tricks of the backcountry flying trade. Your local backcountry community will have all the resources and tribal knowledge to keep you safe, in compliance and environmentally responsible. Each destination has certain unique considerations for pilots and planes. Luckily, there are resources, including guides to remote strips in Idaho, Utah and Baja, Mexico, that provide you with landing strip information and photos, including recommended approach and departure procedures, cautionary notes and any area-specific use restrictions. These guides offer invaluable guidance on hundreds of strips, some of which you can’t get anywhere else. Use them, but make sure the information provided is updated and current. As you’ll find when you start exploring the available resources, there are a lot of backcountry strips to fly into, and they span the country, from the outback of Maine to the deserts of southern California. In many cases, you don’t have to travel that far to get an authentic backcountry experience. It’s the pilot—not so much the plane—that opens up the backcountry. Bonanzas, Cessna 172s, 182s and 206s, Piper Archers, Cherokees and the like are prevalent on the grass and in the dirt, too. The key is to know your plane’s limitations and plan accordingly. In the case of the Tri-Pacer, clearly you’ll be able to carry less weight, you’ll need more runway for departure, and you’ll have to avoid really rough strips. If you own a Maule or Aviat Husky, well, your options are greatly expanded. And we won’t even get started with airplanes outfitted with big tires. You don’t need big tires and a tailwheel to enjoy the backcountry. John Priscu’s nosewheel Maule is right at home. Before you do anything else, you need to make sure your basic flying skills are up to snuff. In fact, if you want to become a better, more proficient pilot, this is a great way to do it. One of the keys, I found, is to take it slowly while working on basic skills. By practicing skills like short field takeoffs and landings in your airplane with your mentor/instructor, you’ll get the skills and tips you need to be safe and confident. There’s much to learn. Did you ever think of pacing off the length of runway available for your landing and takeoff rolls? By taking time to do this, you not only get some exercise but you will also get to know your bird and its performance at high-density altitudes and determine a specific go-no go spot on the takeoff roll for each strip before you depart. Some pilots worry that landing on grass will be hard. The truth is the opposite, that landing on grass is soft (sorry). The roll out and taxi may be a bit bumpy; braking action can be reduced when the grass is wet, and the takeoff roll in wet grass can be a bit longer; otherwise, your touchdowns should generally be softer and directional control in a taildragger easier. In general, it’s not so much the grass surface that warrants attention (unless it’s wet and soft). 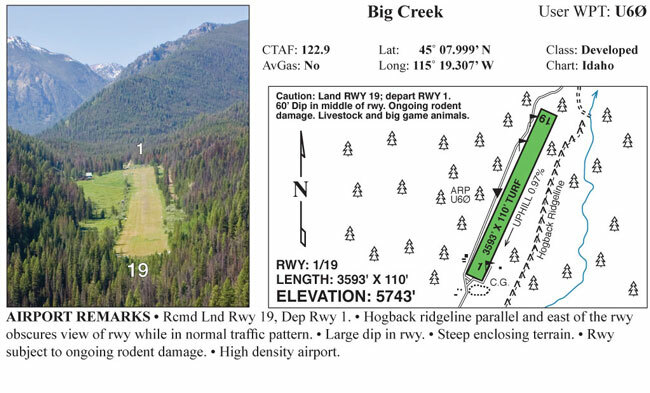 It’s more the runway placement, how the surrounding terrain affects approach and departure, the slope of the strip, as well as obstructions, branches, rocks, rodent burrows, deer and elk…it’s not a short list of things you need to look out for. And for the record, in selecting landing and takeoff direction, slope trumps wind direction and speed most of the time, and that’s just one of the many factors that you need to take into consideration when scoping out a new strip. With a little training, you will learn ways to deal with these issues with confidence; you will know how to determine runway slope and quickly calculate how much effect a particular slope will have on your takeoff distance and landing rollout. This is critical knowledge for safe backcountry operations. But once you get it, and when you use it, you will be cool no matter how hot and high the strip is, though there are some days when heading to the next, longer strip might be in order. Indeed, “being cool” might mean waiting until the next morning to leave. Get-home-itis is a deadly disease for pilots in general and especially for backcountry fliers. But with the right planning mindset, equipment and a few training tips, an extra night or two in nature is no big deal and might even be part of the fun. In backcountry flying, you will seldom fly a standard landing pattern and often will have to dip your toe in the water with a pre-landing recon of the approach corridors at high, medium and low altitude. And you’ll learn to drag the field to determine surface condition and obstructions. Wildlife on the runway, rocks and rodent burrows, for example, are often well camouflaged and difficult to see prior to landing. Klaas Lammers from South Africa, arriving in the Glacier National Park area in his Carbon Cub. Klaas travels to the U.S. every year to experience the splendor of the wilderness. A course in mountain flying is not required by the FAA, but you should consider it mandatory—unless you’re totally lacking in judgment or are just insane. In a well-crafted course, you will learn and practice tricks of the bush pilot trade, like how to recognize and take advantage of the unique micro climates you will encounter in, say, canyon approaches/departures or in crossing steep ridgelines. You will learn how to read surrounding terrain, determine go/no-go point on the takeoff roll, post-departure climb path and post-rotation abort procedure for each particular strip on each unique day. You will learn how to plan for and what specialty survival equipment to carry in the event changing conditions compel you to stay put for a while or, heaven forbid, you need to make an off airport landing in a remote location. On every backcountry trip, you will include very affordable hand-held SATCOM equipment, equipment that can track your flight for position monitoring by family and friends over the internet, send and receive text messages, and even contact Search and Rescue automatically with one push of an “SOS” button—no cell signal required. A good mountain flying/backcountry course will provide solutions, resources and knowledge, in addition to your newly honed skills to keep your trips full of adventure and free of adversity. This is fun stuff. My introduction to backcountry recreational flying began with a visit to TacAero, a relatively new FBO near my home in Portland, located in Hood River, Oregon, on Ken Jernstedt Airfield (4S2) at the base of Mt. Hood in the Oregon Cascades: God’s country. 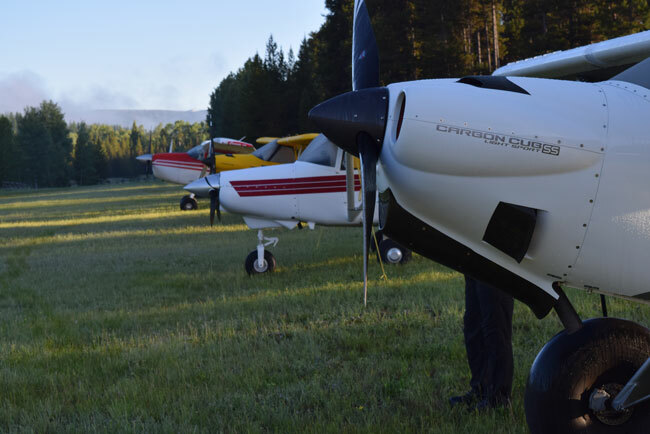 In addition to ramp and fueling services, TacAero is a factory-designated Cub Crafters transition training center and, in addition to tailwheel transitions, offers basic flight training through commercial, IFR, CFI/CFII and backcountry flight training. They also offer a nifty and fun three-day aviator’s survival training course and will help you design a carry-along survival kit. The outfit also trains Department of Interior and U.S. Forestry Service pilots for backcountry operations. TacAero Chief Pilot Wes Valpey is a seasoned Alaska bush pilot and backcountry pro from an aviation family; an aviator who must have learned to fly soon after he learned to walk. So I was fortunate to get a backcountry course demo flight with Wes in one of TacAero’s Carbon Cubs. Hood River features a grass strip running parallel to the hard surface runway that TacAero shares with the glider and antique birds based there. The grass strip is marked off with painted cones at 50-foot intervals specifically for use in training, practicing and evaluating spot landing, short field takeoffs and for tangible demonstrations of the effects of density altitude on these maneuvers. The accuracy of density altitude/aircraft performance calculation protocols taught in the backcountry courses is validated through actual measured takeoff and landing rolls at different density altitudes—priceless and focused critical skill development. The first time you use your newfound knowledge on an actual backcountry strip, you will have the confidence that your skills and calculations are accurate, proven and reliable. For an actual backcountry sortie demonstration, Valpey took me about 30 miles eastbound to the Deschutes River to a strip called Bull Run. At Bull Run, Valpey demonstrated how to approach a strip like this for the first time. Just below the canyon rim, the river is about 1,000 feet below us. Down 1,000 feet to our left are the river and strip; to our right—just off the wingtip—is the east rim and canyon wall. We fly parallel to the strip, tightly hugging the east wall. It’s clear from our vantage point that almost immediately after lifting off, we will have to make a 30- to 40-degree right turn and then a quick S-turn, following the river snaking its way north as we climb back out. Approach to land will be a similar event in reverse. Eastern Oregon crossing the Deschutes River where the deer and the antelope (and soon, two backcountry aviators) roam. Next step, find the strip. There’s no room to do a 180 in sight of the strip. It’s boxed in between two bends in the river. So we make four successively lower passes over the strip, each time waiting to make our 180 descending turn at a wider spot in the canyon up- or downstream and out of sight of the strip. By the fourth pass, we are about 800 feet below the canyon rim, snaking our way downstream directly over the river at the bottom of the canyon. Around the bend and there it is—45 degrees and a quarter of a mile off our nose. Wes eases down for a low pass. The river-side edge of the strip is highlighted by a line of basketball-sized rocks painted white. Everything looks good. No obvious obstructions, no big rocks from the surrounding cliff faces have fallen on the strip. No elk moseying across the strip. Again, we fly back up the river to where it’s wide enough to turn around, fly the last approach again, and, this time, as we round the bend at 200 feet and pick up the the strip on the 45, Wes pulls power, deploys flaps, makes a slight descending turn to the right on final and bingo—an almost simultaneous flare and touchdown, a short roll-out, and we arrive in a magical place. Engine shut down and instant quiet. Still. Just the soft white noise of the rushing Deschutes river. The timeless vertical canyon walls tower above and enwrap us: the west cliff in shade—the top half of the east cliff in bright sun, scent of the sage and a strip of dark blue eastern Oregon sky directly above prove to me that the airplane is, in fact, a magic carpet that can transport us to special hidden secret places. I was hooked and the lesson continued. 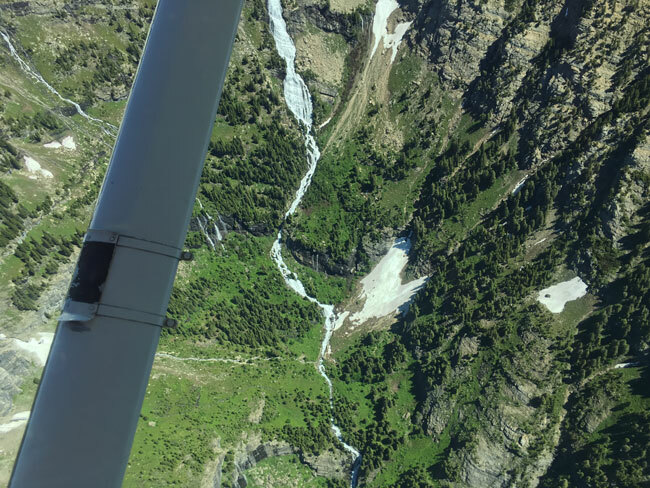 In fact, in backcountry flying, one of the chief attractions is the feeling that every strip you fly into is a brand new experience and not just another patch of asphalt. And every one you fly into requires your full attention, both before and after you land. Before our departure, Wes and I paced the strip end to end, looking for hazards, noting a landmark at midfield, and setting that as our abort point if not airborne by then. Wes shared lore and knowledge all the while; he discussed the micro climate, the winds, the surface and much more. Many of his comments seemed counter-intuitive, making sense to me only in the saying and in the context of the lesson. Wisdom and technique aren’t easily or safely discovered without a mentor—learning proven skills born of experience. Shortly after this demo flight with Wes, I put my newfound skills to work, spending a long weekend camping and flying the backcountry in and around Glacier National Park with several aviators who exemplify the essence of the recreational aviation community. When I got home, I was altered. I canceled my cable. I subscribed to a newspaper, put the smartphone down, and started to take much longer walks. The unabashed passion, love of airplanes, and flying so fresh and strong in those early student/private pilot days was reborn anew, and I understood why the RAF’s motto is, “It’s why you learned to fly.” It’s why I did, and probably why you did, too. Room with a view—quiet, no crowds, no signals, and no charge. Unique to backcountry flying. There are many websites dedicated to wilderness and backcountry recreational activities. 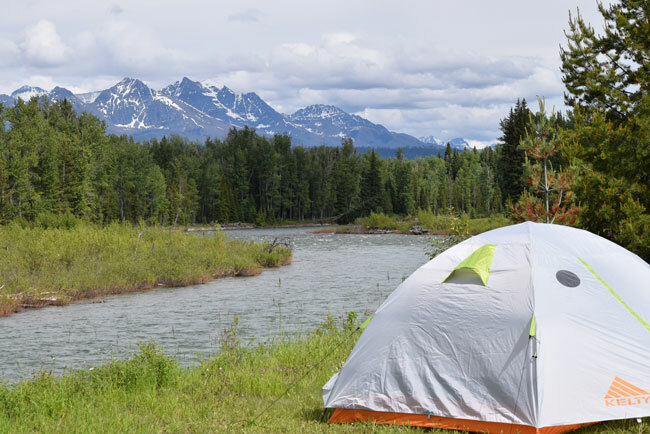 The Wilderness Connect website, operated by the University of Montana, is a great primer on the development of public lands, how they are managed, access rules and responsible agencies. Wilderness Connect offers “information about all of the 756 wildernesses that make up the National Wilderness Preservation System.” The database is searchable and easy to access. Wilderness Connect dovetails nicely into the information presented on the Recreational Aviation Foundation (RAF) website. The RAF website provides a ton of important information for pilots interested in backcountry flying as a solitary or family activity. On it, you will find a list of state RAF liaisons. These are the folks to call to get started and meet the backcountry tribe in your state and region. The RAF works closely with state and federal governments as well as general aviation groups such as AOPA (Aircraft Owners & Pilots Association) and GAMA (General Aviation Manufacturers Association) to protect pilots’ rights while continuing to develop a responsible backcountry aviation community. Fly inns (get it?) are more prevalent than you may imagine. They range from fly-in- or hike-in-only luxury resorts in the middle of a wilderness area like the Minam River Lodge in eastern Oregon to a primitive landing strip in the middle of nowhere, like Big Creek, Idaho. In no time at all, you will have an almost overwhelming list of places you will want to go. The most basic strips, kept up by pilot and enthusiast volunteers, often feature pre-cut fire wood and maybe even an outhouse. Every strip is different. Some are on private land, and you will need permission and most likely a safety briefing on the strip before flying in. Ryan Field (2MT1), co-owned and maintained by the Recreational Pilots Foundation, is an excellent example of a fly-in campsite with excellent amenities. Visit the Pilot Briefing site for details. Sample of FLY IDAHO strip information. Surely you would want to go in the first time with someone who knows the ropes; know the density altitude/performance and load accordingly. Lou, Wonderful article and photos. You captured so much of what I, too, love about the backcountry strips and surrounding areas. Shafer Meadows is one of my favorite places, along with West Glacier. Kudos for a great article.